Home » Vietnam Travel » Attractions in Vietnam » What Is In Va Cave – The Most Special Cave In The World? 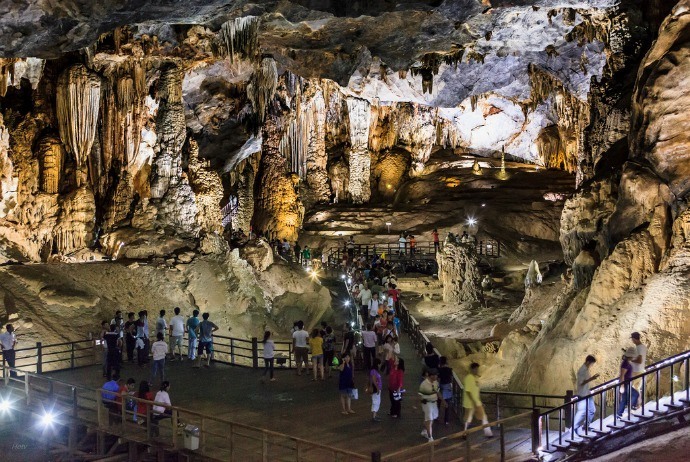 This cave is about to be put into operation in Quang Binh (Quảng Bình) tourism, which has more than 1,000 stalactites with size uniformity and almost impossible could be found anywhere else. The expert specializing about caves – Howard Limbert said, Va Cave is located in the core zone of the World Nature Heritage Site of Phong Nha – Ke Bang (Phong Nha – Kẻ Bàng) (in Bo Trach (Bố Trạch) district, Quang Binh (Quảng Bình) province). Mr. Ho Khanh (Hồ Khanh) discovered this cave in 2000, then the “King cave” led the couple to discover. Mrs. Deb (55 years old, wife of Howard Limbert) is the first person expediting this place. The British expert have identified as above is because he has discovered that a species of fish living in Son Doong cave is also living in Va Cave. Limber also said that the groundwater in these two caves is linked together by a small vent, so that strange fish could coexist in two places. The answer for the association to clarify if Va cave and Son Doong cave interconnecting with each other or not is still in mystery. If you want to go to Va cave, after traveling by car from the center of Son Trach commune to the Km 28th Ho Chi Minh road to the west, tourists will continue trekking. 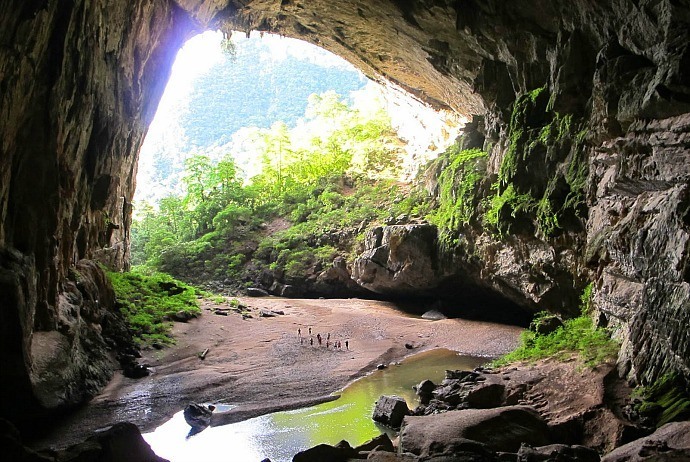 The journey to Va cave will witness a lot of beautiful scenes of Phong Nha – Ke Bang forest. Experiencing the journey of walking on foot for more than 1 hour, tourists will stop to discover Nuoc Nut (Nước Nứt), the cave discovered by Nguyen Huy Du (Nguyễn Huy Du) (58 years old, security guard of Oxalis – the tour operator exploiting Son Doong tour). Tourists will continue to walk one hour further to get to the cave, have overnight camping in the cave. In the next morning, they will discover the cave within a half of day and return, ending the journey. According to the expert Howard Limbert, if this discovery tour is put into operation, visitors will experience the journey of over 20km in total, lasted for 2 days and 1 night. “Va Cave is the most special and different place in the world because there is a stalactite system with about 1,000 cubic with even sizes. The stalactites look like growing up from the group. These stalactites are very precious, fragile and nearly unavailable in anywhere else all around the world,” Limbert said. The British expert also said that, exploiting this type of tour needs special attention in protecting the stalactites. The tour operators have to build a system of wooden bridges for tourists to go across in order to avoid damage the fragile stalactites. The expected wooden bridges will be shorter than the one in Thien Duong (Thiên Đường) cave because the core of Va cave is narrower and more difficult to discover than En Cave. This tour should not be missed by people who love adventure travel because the journey of discovering is favorable and does not require high standards of health. The plan of exploiting the tour named Va cave – Nuoc Nut Cave, the different experience has been presented to the province authorities. This tour is put into operation in July, according to expectation. Quang Binh provincial People’s Committee will carry out a survey before licensing for one of local travel agencies.